The Canyons Resort in Park City. Location of the Evo Conference 2011. 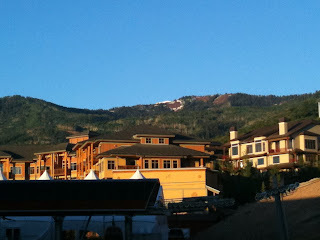 Recently, I attended an informative and uber-cool event in picturesque Park City, Utah. Evo Conference: The Evolution of Women in Social Media many talented women (and men) in social media were there. Many of them have blogs. Some write more than a few blogs (that just makes me tired). I learned a lot about using social media, working with brands, building a better blog, and how to make vlogs that won't stink. (A "vlog" is short for video blogging. One of the presenters for that session was Jenny on the Spot...vlogger extraordinaire. Check her out here). Me and vlogging sparkle star, @jennyonthespot at #evoconf. 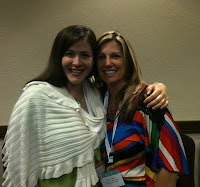 One of the sessions I went to was led by three smartypants editors of BabyCenter (find them on Twitter @BabyCenter). They taught us how to write better and nurture our blogs so they can grow. They were knowledgeable, approachable and adept — filling our heads with lots of useful information on how to get better at our online craft. Compelling: Engage your readers. To inspire comments, finish your post with a question asking for their perspective. Photo: Upload a great photo (or photos) to illustrate your post. Make sure you include a caption, photo credit, link, and alt text when possible. Links: Check your links to make sure they're working and linking to the correct pages. If there are opportunities to link to fellow blogger or a past link of your own, do it! Tags: Use Google AdWords to develop a list of key words and trending terms when possible. Spell Check: Don't simply trust your computer or blogging platform to check for proper spelling. Double check all proper nouns and word usage. Common misspellings the electronic spell-checker won't catch: its, it's; to, too, two; their, they're, there; your, you're. Punctuation: Do all sentences end with punctuation? Make sure you're not over using exclamation points. My own personal rule of thumb is one exclamation for every 500 words. When you use them sparingly, they have more punch. Read aloud: Right before you post, read your writing out loud to yourself. This will help you catch typos and grammatical errors that might confuse your readers. Promote: Post your content on Facebook and Twitter. Give your story a thumbs-up on StumbleUpon. Pinterest your post. Start a thread about your post in online communities. Email a link to your story to competing blogs so they can include it in a similar story. Don't be shy. What a treat! 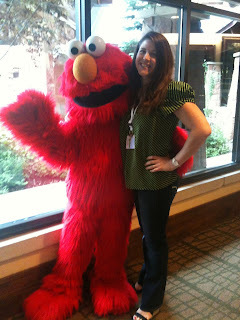 Meeting Elmo at the Evo Conference 2011. In other news...and because I want to brag...I met Elmo at the Evo Conference! Want more details about the Evo Conference? Check out this very thorough conference wrap-up blog by Laurie, the Tip Junkie and another social media babe. Hope to see you at Evo Conference 2012 — registration is open now! Hi Pam! It's Amy from BabyCenter! Thanks for attending our session and Evo and for sharing our tips.